Space Unicorns! We need your help! Uncanny Magazine Year Two: The Return of the Space Unicorn! The Kickstarter is LIVE! 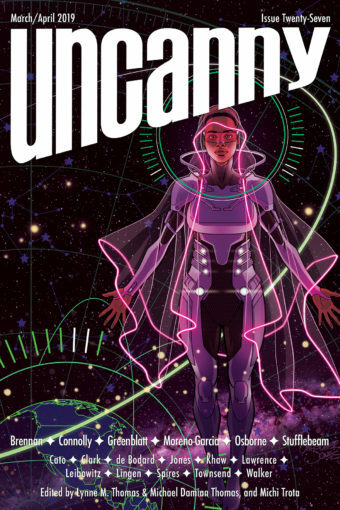 Last year, three-time Hugo Award winner Lynne M. Thomas & three-time Hugo Award finalist Michael Damian Thomas ran the Uncanny Magazine Year One Kickstarter. We promised to bring you stunning cover art, passionate science fiction and fantasy fiction and poetry, gorgeous prose, and provocative nonfiction by writers from every conceivable background. Not to mention a fantastic podcast featuring exclusive content. With the hard work of the best staff and contributors in the world, Uncanny Magazine delivered everything as promised. All this content is available for free over the web, thanks to yoursupport. Though Uncanny has developed several additional funding streams to make the magazine sustainable, we’re not quite there yet. Which is why we’re running the Uncanny Magazine Year Two: The Return of the Space Unicorn Kickstarter. If you’ve been looking for an opportunity to join or rejoin the Space Unicorn Ranger Corps, now’s your chance! Our Year Two goals will bring Uncanny closer to sustainability by paying for more great content and making sure the magazine’s business infrastructure is solidified. On deck for Year Two is an outstanding group of solicited contributors, fantastic backer rewards, plus some additional surprises. There will also be more slots for unsolicited submissions (we reopen in September). We’re deeply committed to finding and showcasing new voices in our genre from around the world. Uncanny Magazine is published as an eBook (MOBI, PDF, EPUB) bimonthly (the every other month kind) on the first Tuesday of that month through all of the major online eBook stores. Each issue contains 3-5 new short stories, 1 reprinted story, 3 poems, 2 nonfiction essays, and 1 interview, at minimum. Our monthly podcast includes a story, a poem, and an exclusive interview in each episode. Kickstarter Backers at the Subscriber Level or higher, and those purchasing single issues, get each issue in its entirety up front, no waiting. Those reading online for free wait a month for the second half, which appears on the second Tuesday of the month athttp://uncannymagazine.com/. We at Uncanny think we’re doing important work, and we’d like to continue. Please consider supporting Uncanny Magazine Year Two. We hope you’ll consider supporting us by joining the Space Unicorn Ranger Corps!